Jordan Valley. The agricultural lands of An Nasariya are considered the food basket of the Nablus area. 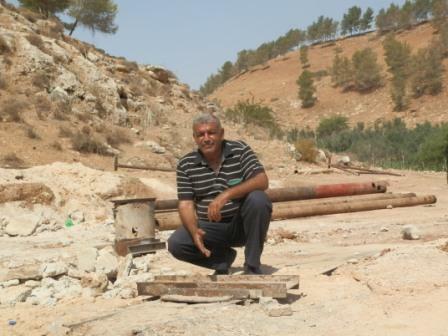 On 8 September 2011 Israeli soldiers (without a demolition order) forcefully destroyed three Palestinian water wells of this farming community with a bulldozer. The soldiers confiscated all the equipment, including pumps, engines, filters and 4 000 liters of gasoline (at 7 NIS per litre) that provided water to a network of farmers and threw the owners’ tools into the wells. Nagahe at the place where his well used to be. His tools were thrown into the hole. Now we understand the Oslo Agreement. In this agreement, all wells that were built between 2002 and 2005 may not be demolished. But Israel does not keep this promise. 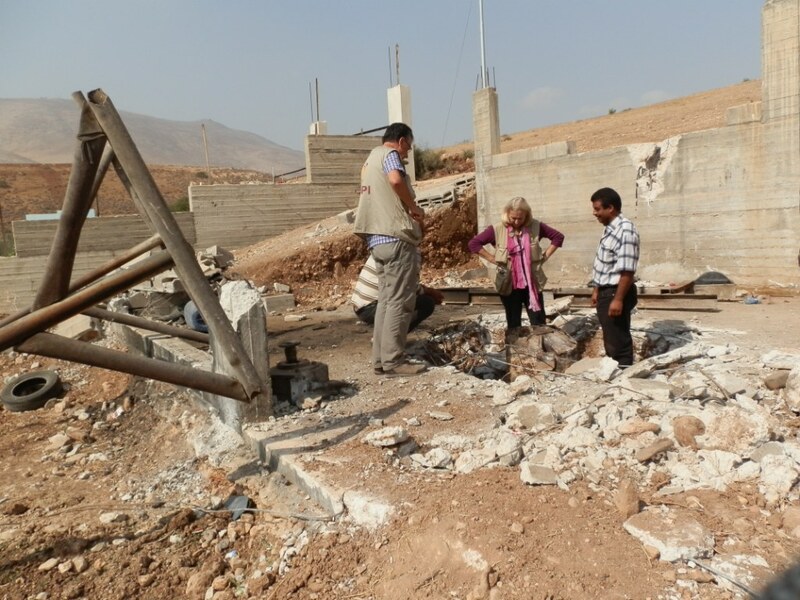 I went to court after the second demolition, but it is a military court and they told me they cannot help me and that Israel had to destroy my well for security reasons. I am a farmer. I plant tomatoes, onions, cucumbers, melon, aubergines, peppers and many other things. Our sheep eat the foliage after we have harvested. Now we have no water and we cannot plant and our sheep drink the sewage water from the open canal. When it happened, I just stood there. I felt so angry, but I could just stand looking. There were so many soldiers and military vehicles that came for us and we are just civilians. All we have in our hands are plants. It took about three to four hours and it all happened right in my face. No one was allowed to enter this area when it happened. I was thinking of all the other farmers who depend on the water. I fell down to the ground and was taken to a doctor. We do not get support from the authorities or from NGOs. The PA talks to the Israelis to get permits for our wells, but they never return with signed documents. They also don’t get help from the UN. Our water hole gives only 7 m3 per hour and the Israelis get 500 m3 per hour and still, we may not have water. Before 1948, Jews and Palestinians were neighbours in this area and we all had good lives. We are willing to live with Israelis and we will share our water. We live in a holy land and we do not want to suffer anymore. We ask – what does the world think to watch us like this? We need money to repair our wells and we are scared that they will demolish it again. The other two owners of wells and I decided that we shall now rebuild only one well, then we can share the costs. But it also means that we shall produce less. We know the Israelis will destroy our wells again. But I have been a farmer all my life. My father and grandfather also farmed on this land. This is what I do. We now live with this, we will not move. We stay here. This article was published in the UNOCHA Monthly Humanitarian Monitor, September 2011.